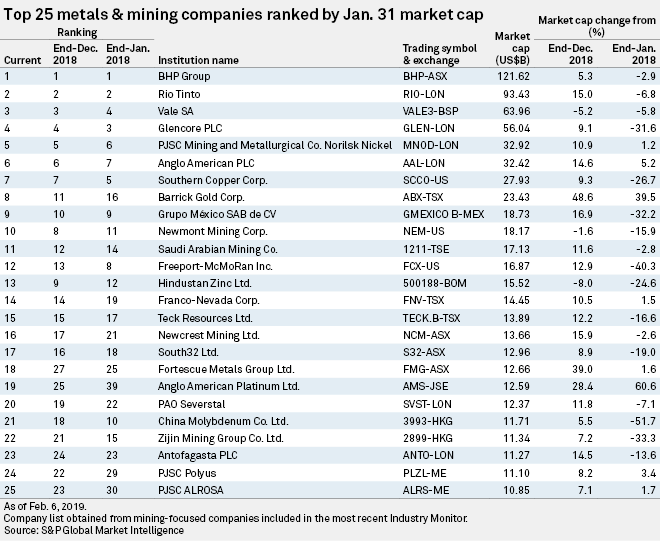 Miners Barrick Gold Corp., Anglo American Platinum Ltd. and Fortescue Metals Group Ltd. earned enough market value in January to see large gains in rank among the top 25 global metals companies. Barrick, which closed its merger with Randgold Resources Ltd. on Jan. 1, saw its market cap rise 48.6% in the month to US$23.43 billion, gaining three spots to rank eighth, according to S&P Global Market Intelligence data. At the end of December 2018, Barrick Gold ranked 11th with a market cap of US$15.77 billion. Australian iron ore producer Fortescue Metals gained 39% in market cap to US$12.66 billion, but the amount is just 1.6% above where it stood a year ago. The sharp rise from December 2018, which lifted the company's rank by nine spots to 18th, comes as certain industry observers see a positive outlook for iron ore pricing in 2019. The company reported a 5% annual increase in iron ore shipments in the December 2018 quarter. Anglo American Platinum, with a 28.4% increase in market cap to US$12.59 billion, improved in rank to 19th, from 25th in December 2018. The company is 80%-owned by Anglo American PLC, which is based in the U.K. Overall, 22 of the top 25 miners had a higher market cap between December 2018 and January 2019. That overall uptick across the sector in the new year contributed to an aggregate market cap of US$687.01 billion, up 9.2%. BHP Group, Rio Tinto and Vale SA comprised the top three rankings, consistent month over month, with BHP Group increasing by 5.3% to reach US$121.62 billion, and Rio Tinto increasing by 15% to US$93.43 billion. Vale was among only three companies with a declining market cap, retaining its third-place ranking with a 5.2% decrease since December 2018 to US$63.96 billion. The company also saw a dam failure in late January at its Corrego do Feijao iron ore mine, spilling mine wastes and causing 150 deaths as of Feb. 6 with another 182 people missing. In response to state regulators and courts in Brazil, the miner plans to cut 10% of its output as it decommissions 10 dams over the next three years and transitions to dry iron ore processing. Newmont Mining Corp. also saw a decline in its market cap since December 2018, down 1.6% to US$18.17 billion. That level could change after the company, which is the second-largest gold producer after Barrick, announced plans in mid-January to acquire Canada-based Goldcorp Inc. in a US$10 billion deal expected to close in the second quarter. The third company that saw a drop in its market cap since December 2018 was Hindustan Zinc Ltd., which fell to 13th from ninth after its market cap dropped 8% to US$15.52 billion. The zinc and lead producer is 65%-owned by Vedanta Resources PLC, which reported lower earnings and profits during a January conference call covering results for its fiscal third quarter of 2018. Although most of the top global miners gained market value in January, 17 companies are still valued lower year over year. The value of the metals sector fell over 2018 as prices for key base metals such as nickel, copper and zinc declined due to market conditions, falling crude oil prices and the backdrop of the U.S.-China trade war. S&P Global Market Intelligence's Metals and Mining Company Two-Page Profile provides in-depth financial and industry data for covered metals and mining companies. The Metals and Mining Mergers and Acquisitions template can be used to search comparable M&A data for the industry. Deals can be filtered by date, deal value, reserves and resources acquired, and average price paid for a commodity.